Product #22026 | SKU SC-Reach-plus-3 | 0.0 (no ratings yet) Thanks for your rating! The Secced Reach Plus 3 Kit from Cinegears comprises of the SC-ENG/CF100D two-stage carbon fibre video tripod with ground spreader, SC-V15/100RP fluid video head, and the SC-PB15 pan bar. 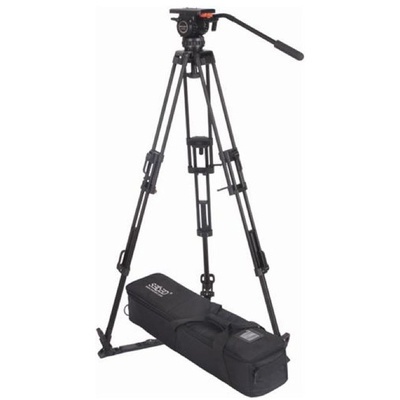 This tripod system offers a maximum payload of up to 20.8 kg, with support for portable broadcast camcorders in ENG configuration. The video head mounts on the tripod via the 100mm integrated ball. The two-stage carbon fibre tripod comes with a traditional build (top and middle sections are twin-tubed), features a speed locking system that ensures quick setup, and comes equipped with a ground spreader. The legs can be adjusted to provide a height ranging from 48 to 155 cm with the ground spreader. The lightweight tripod offers adequate torsion rigidity, which is essential for achieving smooth camera movements, and determines how resistant the tripod is to twisting mechanical influences during pan. The fluid head of the Reach Plus 3 system features a balance adjustment lever designed to duplicate the available counterbalance steps. Its drag system provides a smooth operation with graded adjustment for fast change of tilt and pan drag. The head also features a quick release mechanism that ensures quick mounting or dismounting of the camera. It features a 100mm integrated ball, and all main parts are made from high-quality CNC machine, ensuring reliability and improving fluid head performance substantially. High-quality hard plastic is used in the manufacturing of all plastic parts of the head, enhancing rigidity under all types of production conditions.